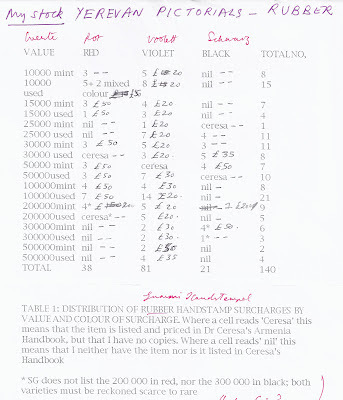 I have previously Blogged about this issue and in the past I mentioned the Lists I had made many years ago when I acquired Dr Ceresa's holdings of this issue, in the mid 1990s. I now publish those Lists. 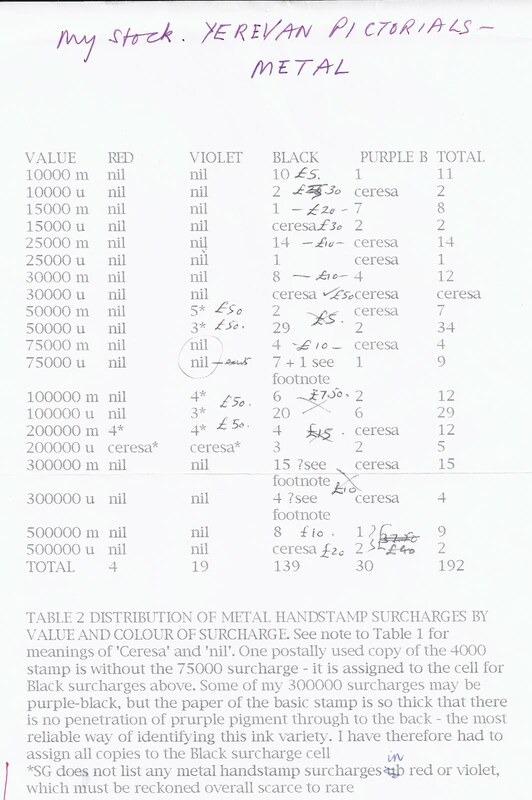 Basically, when I write "nil" this means I did not have the combination of stamp and overprint in question AND that it is not listed as existing by Dr Ceresa in his Armenia handbook. 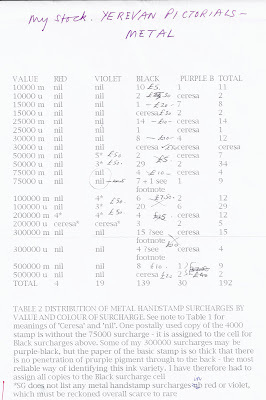 But where I write "Ceresa" this means that Dr Ceresa lists and prices it BUT that I did not have a copy. My original selling prices are written in by hand, ranging from £5 to £200 (the £200 was a bit optimistic and I don't think I ever got £200 for one of these stamps even though some combinations are very rare). It is clear even from a quick glance that for METAL handstamps overprints are normally black and that for RUBBER handstamps overprints are normally VIOLET. This weekend I am assembling a collection of as many varieties, mint and used, as I now have (I later added to the stock I originally got from Dr Ceresa). It will be quite an extensive collection and I plan to offer it to Corinphila, Zurich for their auction in early 2013. There are several detailed listings of the overprints on these stamps. Dr Ceresa's is not quite complete as I realised putting together the collection referred to above - I found two unlisted varieties in my stock. 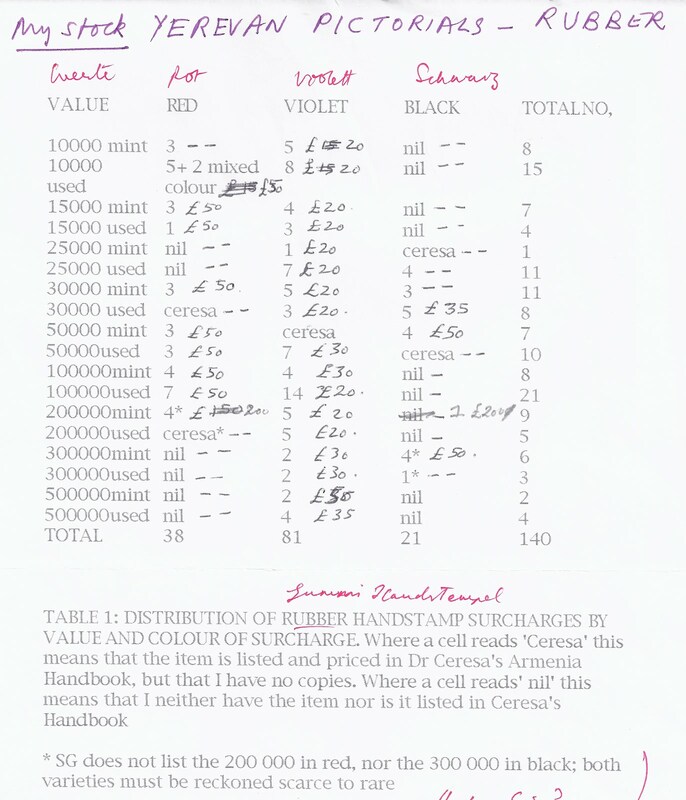 Christoper Zakiyan denounces post - 1923 production of new varieties (specifically, new handstamp colour varieties), but he does not list or illustrate them so we do not know what to look for. I do think it very likely that the Soviet Philatelic Agency did use original handstamps and authentic inks to create fresh stocks either of new varieties or scarce original ones. These varieties are often signed SPA on front or back and are only found in mint condition. Artar has very good illustrations of many genuine types,but there are also faked items illustrated i the postal history. The catalogue listing itself unfortunately cannot be used because of an uncritical approach to what it includes - for example only, no previous writer has claimed that a rubber handstamp for the 75000 surcharge exists and it is reasonable to ask for more evidence before accepting the existence of a previously unrecorded (and very highly catalogued) variety shown only in an unexplained mint example.